Clash of Clans seemed to come out of nowhere. Maybe you saw it suddenly pop up in the “Featured” section of the App Store, or maybe you saw one of those goofy commercials, but the next thing you knew, this game was everywhere. And while there have been viral games before (Angry Birds, anyone? ), the competitive element of Clash of Clans helps to keep it fresh and in people’s awareness: it’s not just a matter of getting better at the game, you also have to get better than everybody else playing the game. With Supercell constantly coming out with new units, new spells, and new enemies, there’s always something else that has to be mastered in order to stay afloat. To that end, you may be an expert, or a novice but everyone can use some great Clash of Clans tips to help them get a little more resources or enhance their overall gaming strategy. That’s why I’ve created this guide and hopefully give you a good sense of the very best tips you can find. I’ve compiled a number of ideas from around the web in addition to ideas that I’ve gotten just by playing CoC on my own. I hope some of these are a real help to you. And if you’ve seen this before, remember that Clash of Clans is more than a game, it’s a community of players that are constantly helping their friends (and even, on the internet, total strangers) get a little bit better. So, if you know something we don’t, mention it in the comments, and it may show up in a future version of this article. As with many complex and incredible games, there are a variety of strategies from a more defensive to a more attack focused play. Depending on what your overall strategy is, you will notice that there are different tips that can help you more than others. If you have any other ideas, we welcome your comments in the comment section below! Now, without further ado, let’s get into some of these tips and hopefully get you on your way to beating the enemy quicker, easier, with more resources, and a whole lot more fun. Remember, some of these tips will also be better if they are used on a tablet versus a smartphone and you may find it beneficial to play Clash of Clans for PC to enhance the gaming experience. You can get a bigger screen and a whole lot more power from a PC than an iPhone, Android, or iPad. This may seem a little silly, but the number one tip I have to give is that you play CoC as often as possible. The more you upkeep your clan the better you’ll learn your own strategy and be able to tweak your play to make everything better. As with almost anything, practice makes perfect. Also, like so many other games out there, Clash of Clans employs a system of timed upgrades and timed resources. Keeping a note of when these clocks run down, and playing often, will help you make sure you’re not losing any resources, but rather are playing CoC to your fullest potential. I’ve noticed a tremendous improvement in my gameplay when I went from playing every once in a while over the weekend to playing daily and multiple times a day. That is when I started to pick up on the nuances and the complex strategies that can be employed depending on your tactical expertise, your level of experience, and your preferred method of attack or defense. Another good thing about playing multiple times a day is you don’t have to sink so much time into the game at one sitting. You can fire it up, reap your rewards and make some progress and then, instead of digitally twiddling your thumbs until a countdown timer finishes, you can just put it aside, confident that you can come to it later. As outlined in Malcom Gladwell’s book Outliers, it is estimated someone requires 10,000 hours of practice to become an expert at something. Therefore, I’d recommend starting early and playing often. You will notice throughout gameplay that a lot of people bounce back and forth between being more offensively focused and attacking and raiding other villages often. The other end is a more defensively focused where you hoard your gems until your clan is at a certain size. Both an offensive and a defensive strategy can give you the win but it more depends on personal preference in gameplay. Make sure you choose early whether you want to build an offense focused or defense focused clan. Granted, if you focus on one, you don’t want to neglect the other, but if you don’t focus at all, you’re going to end up with everything being a half measure: your defense won’t be strong enough to hold off attacks, and your offense won’t be solid enough to retaliate properly for the resulting invasions. If you’re focused on defense, you will want to collect resources and build your treasury as much as possible without spending all of your resources. 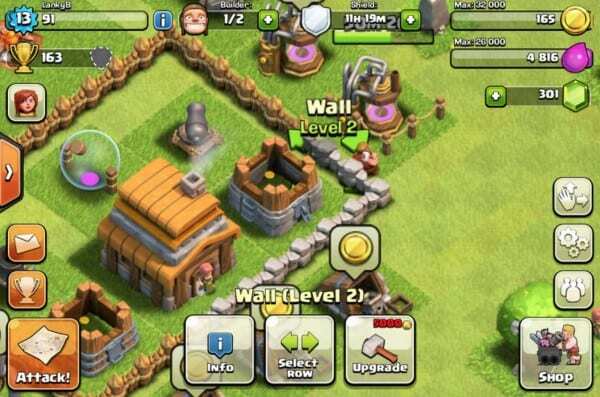 You should upgrade your town hall very quickly and make sure all of your walls and defensive buildings are up to snuff early on. A good starting point is to make sure you upgrade your mortars first, then move on to your archer towers, then cannons to round out the defense. This is of course, in combination with your walls. It’s good to have your defensive towers toward the center of your village so they can defend the maximum coverage within your village. I normally recommend that new players start out by focusing on their defenses. No, it may not be as fun as attacking, but you can get a buffer between you and other players on the same level, which will buy you enough breathing room (and time) to explore the game at your leisure, and come to a fuller understanding of its mechanics so you can really become effective later on. If you’re focused more on offense, you will want to do some of the same things but switch things up slightly. As with defense, you will want to build up your town hall right from the start and then get all of your production on elixirs up so you can get a good stash of resources. The next thing you’ll want to focus on is to get your army by building your barracks and camps. This will be essential to amass a sizable army up front so you can go out and raid, and then focus on defensive structures later like walls and cannons. There are predictable rates that you will gain resources and these are essential when you optimize how you develop your clan and build up a routine checking on your game. It’s important to think through and plan out your gold and elixir production from the start so you can optimize how often you need to check on your resources and make sure you will have maximum number of resources when you typically play the most. You can head over to the information tab and that will show you the resource generators and show you what their production rates are. This is also helpful when determining when you will have full collectors and need to dump them into some storage container and sock up your resources again. The next Clash of Clans tip is to make sure you know what the modifier levels are when raiding. These will determine how many resources you get from someone when raiding their village. It’s important to keep in mind what your opponents Town Hall level is. If your opponent has a town has level +/- 1 of your town hall level then you will get a 100% modifier. If your opponent is 2 levels above you, you will get a 125% modifier, 3 levels above you will get a 150% modifier. On the flip end, if someone you’re raiding is 2 TH levels below you, you will only get 50% or 3 levels below, you will only get 25%. You can use this tip to make sure that you stay below the bulk of your competition. If your Town Hall level is below a big chunk of other player’s then you may likely get away without having a lot of raids because people don’t want a smaller modifier. It’s important to have a network of walls to help build your defense. The general strategy is to have as many walls as possible to protect all of your resources and make sure it’s as hard as possible for people to raid you. Make sure you scroll around and replay in your mind how it would work for people to try to raid you. It’s helpful to think in terms of your opponent and whether they would be able to get through to your resources or not. Try to find any gaps in your walls and make sure you patch them if there are any gaps. It’s also key to make sure there are no spawnable tiles within your base and if there are, to clean them up by building a tight network of structures. It’s also good to have a bunch of cannons interspersed throughout your base. It’s also important to have your most powerful defense toward the center of your base and less important structures around the perimeter of your base. This will provide a buffer zone that the attacker will have to go through in order to get to your most vital resources. It’s important to make sure you use the element of surprise as strategically as possible. Remember that Hidden Tesla and Traps don’t appear to your opponents when they look at your base and therefore can be used to have the upper hand with surprise. When someone is consumed with the split second decisions and analyzing your base and their plan of attack, they likely will not notice that you have any hidden items. You can use this to your own defense by trying to get all of the attacking troops to fall into a trap of bombs. The next Clash of Clans tip is to put your Clan Castle at the center of your base. This way, your own troops can run out of the Clan Castle and jump over your own walls to defend the base if someone attacks. You can keep a bunch of archers available to shoot at attackers outside of your walls, as well. Another great strategy and tip is to make sure you save your gems and don’t just use them as soon as you get them. 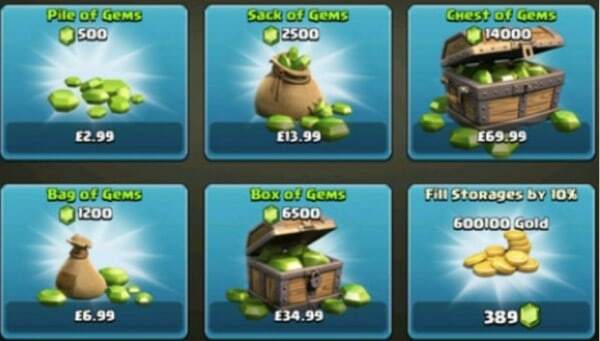 This can be very wasteful and it may not be obvious if you’re new to playing Clash of Clans. When you first start, you will notice you get 500 gems right up front. You have to use 50 gems to build up the initial structures but after that, you can save them and use them strategically. If you look at the breakdown of builders you will notice that it’s more cost effective to wait for the builder 3 or even builder 4. Therefore, save up your gems until you get 500 or even 1000 to use to get a more advanced builder. Once you get extra builders you can construct more buildings at the same time and speed up your base progression. The last tip I will recommend is to find your very own raiding buddy to help you raid as many bases as possible. After you get a good sense of the game and have substantial experience you can start to play with organized clans. These are a great way to have strength in numbers. You can get to know other CoC fanatics and it’s a social occasion but you will also be able to coordinate when you attack a base and get some serious loot. Make sure you’re prepared to provide your own troops to the team as well. No one will want to be on a team with you if you don’t share troops and only use other people’s troops. It’s a great way to build friendships and learn advice from senior and more experienced players. That wraps up this guide and hopefully gave you a good sense of some of the major Clash of Clans tips that have helped me. Let us know in the comments below what you find is the best tip you’ve ever gotten! Also, please share this post if you found it helpful.